One of the advantages of my career as a pastry chef is that people are always bringing me “foodie” gifts. Every event I host I end up with decent bottles of wine, jars of chutney, interesting cookies and other food-based stuff. My personal favorites, of course, are those gifts which revolve around chocolates or candy. So it was I found myself sampling a recent hostess gift – an entire box of Lindt Fioretto. These are (according to the box), “a refined assortment of chocolates with soft centres of Hazelnut, Caramel, Cappuccino & Stracciatella in a crisped chocolate shell.” Wrapped in corresponding colors of brown (caramel), cream (cappuccino), blue (hazelnut) and white (stracciatella), these little nuggets look like they are going to be good before you even open the packet. I’m sorry to say that they are not as fabulous as I wanted them to be. I had hoped for a pimped up version of the Ferrero Rocher but what I got wasn’t that at all. Yes, there was chocolate. Yes, a soft center, and yes, a crisp shell. That’s about it, though. When you unwrap these, they all look very much the same, with the same vaguely dark chocolate stripes across the top. Because the shells are all the same chocolate/crunch combo, and quite thick to boot, you don’t get much of the soft filling. What’s there does taste nice, but it’s nothing to get excited about. The coffee flavor is quite strong, as is the caramel – nicer than the stracciatella (basically chocolate chip) and the hazelnut flavors. I’m not sure why these weren’t such a hit with me. Perhaps it’s because I adore most Lindt products (especially the truffles or “balls”) and so I expected these to be truly outstanding. If there had been less shell and more filling, I might have liked them a bit more. As they are, they pretty much fall into the category of “Hey thanks” instead of “You’re coming to dinner every week!” While I would accept these as a hostess gift in future (hey, who doesn’t like free chocolate?) I also wouldn’t shed a tear if I had to re-gift them to someone else. I LOVE Lindt chocolate! I got four different kinds of the Lindors for Christmas. My favorite are the limited edition milk chocolate shell with whipped white chocolate inside. Thanks for the heads-up on these! Hmmm…maybe I need to become a pastry chef to pump up those holiday gifts! I adore Lindt Truffle balls and gave bags of their 60% dark chocolate one as gifts this year (to the recipients’ huge delight), and probably would have given these, too, had I seen them. I appreciate your giving us Lindt afficianados the heads-up regarding the less-filling-more-shell info. Now that I know what to expect, I do want to try these and see what my taste buds think! Thanks for the review. The Straciatella Fioretto is my favorite chocolate from lindt. I am also a big fan of the Lindor Straciatella truffle. Does anyone know where these can be bought? I no longer have a Lindt store close by. 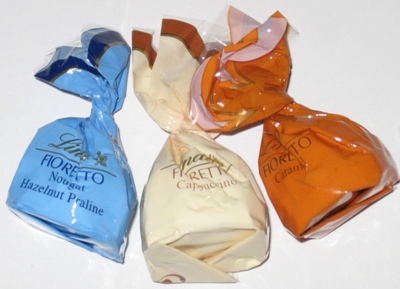 where can i buy fioretto chocs on -line. Could you inform me of where I can buy those chocolates et the Montreal South Shore area. I’ve been looking for this brand “fioretto” without any success for the past year. I even went in the area of Plattsburgh, Malone and Massena in the New-York States without any success. Please answer me as my wife is crazy about them. The Fiorettos are very nice!!! I am a serious chocolate lover and have tried some of the best and the worst in the world of chocolate!! These little gems are “pralines” and yes, the outer shell is very crispy. But the contrast of the harder exterior paired with a creamy middle makes the Fioretto quite delictible!! And the quality and standard of the LINDT name remains intact!! Perhaps you were expecting something similar to the LINDOR TRUFFLES??? Anyway, I think they are great and can’t wait to share them with my friends! !